The Ntimidator Illuminated LED Purge Kits are available in both a show version with a 5lb or 10lb bottle that can be used without a nitrous kit on your vehicle or as an actual purge kit to be used with your existing nitrous system kit! The Ntimidator kits use five bright blue LEDs to light up a plume of Nitrous allowing you to create a smoke and light show on your street car or intimidate your opponent at the races! 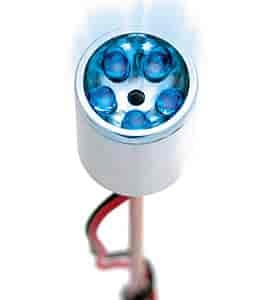 This is the replacement LED light set for the purge kit.